In the days following E3 2010 I couldn’t help but let the theorist out in me, and let loose some speculation on what everything we saw and heard at E3 meant. That gave birth to the article “Skyward Sword: A Theorist’s Speculation”. Well, this year E3 is far from over – but we have already seen and heard lots on Skyward Sword, so it is time for round two of some good old speculation on Skyward Sword’s storyline. Let me start off with the new bird like creatures we have seen. They are extremely integral to the culture in Skyloft, and the humans appear to be their masters. We have a City in the Sky, and we have a prominent bird culture. Could we be seeing some connection to the Oocca here? The Oocca are said to be closer to the Gods than the Hylians though, not under them. Could Skyward Sword explain these two races and how they relate to the Gods? A main point that arises from the new information is that it seems like Hylian culture as we know it comes directly from Skyloft and its bird culture. Look at the birds – they are the spitting image of the bird in the Hyrule Royal Crest. It seems to me that either those from Skyloft inevitably become the Hylians, or form a large role in establishing Hylian culture. The new trailer also shows off several other new characters. We see Link of course, and a female who is almost definitely Zelda. 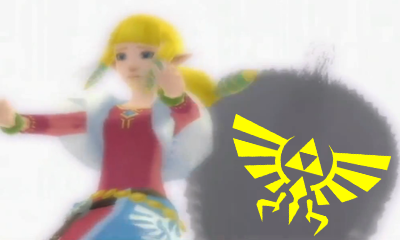 Interestingly, she bears what appears to be the Hylian Crest without the Triforce on her garments. It appears that her fall to the land below eventually leads to the merging off Skyloft culture and the Triforce of Hyrule into the emblem of Hylian Royalty. Skyward Sword then, is likely to show the origin on the Royal Family, and even of Hylian’ themselves. Were they created by the Gods, the Oocca, or someone else? Are these new bird creatures Oocca? On a more minor note, the design of Link’s garments are somewhat similar to Link’s Ordonian garb in Twilight Princess. Moving on from the Royal Family and Hylian culture, we come to the other characters we see in this new trailer. There is the old man – who could be “the old man”. More realistically I see there as being two much more likely options. He looks noble, and thus I am labeling him as either Zelda’s father, and future king, or, he looks more like Rauru – the ancient sage. Some people say Rauru is Kaepora Gaebora, and could this bird-related culture have anything to do with that? Also notice that it is this “Rauru” character who gives Link the Hero’s Clothes. The last focal point I have to make is on the shady, villainous character. We have now witnessed him engaging in battle with Link, and exerting movement properties very similar to the warping style used by the Twili/interlopers in Twilight Princess. What does this mean? I’m speculating that this character has something to do with the interlopers that seek to obtain the Triforce. This ultimately means the story will center around the Triforce being sealed away, The Temple of Time being built (hence Rauru), The Master Sword’s origins, and the rise of the Royal Family. Remember also that the song with Zelda’s Lullaby played backwards has been confirmed as the main theme song for Skyward Sword. 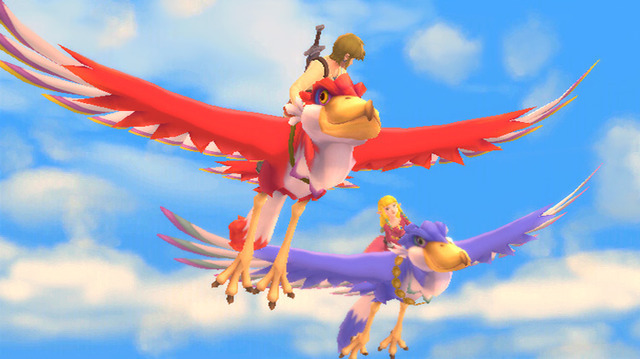 It is known as the song of the Royal Family, so there must be a connection that is integral to Skyward Sword’s plot. There was so much more in the trailer that I honestly have no idea what to say about it. 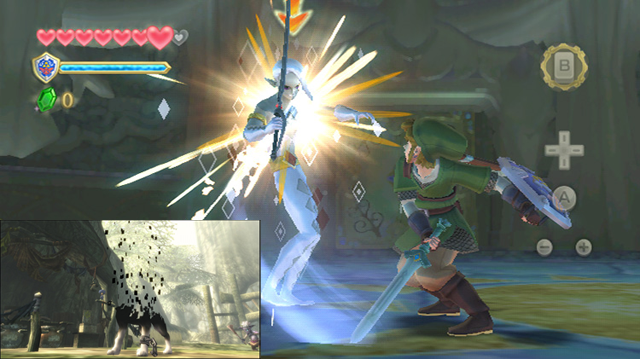 We see the “Skyward Sword” spirit descending to Link from above like she is sent from the Gods. We see Zelda falling from Skyloft and being swallowed by a massive creature, as well as a shot of a stone statue that leads us to think it has some significance. There’s too much to say at this stage – but I can tell you this. All of my past speculation is still as valid as it was a year ago. I’m also confident to say that Skyward Sword – in graphics, aesthetics, gameplay and the hints we have about the storyline – could very well finally top Ocarina of Time. Well, at least in my mind. Skyward Sword should answer lots of questions but also raise many more in the world of Zelda theorizing. Skyward Sword to Show the Founding of the Royal Family?